I am reporting my snowfall totals for this winter because I have promised my daughter that we have seen the last of the snows. Actually, the snow we had last Wednesday was the one I promised her to be the last. 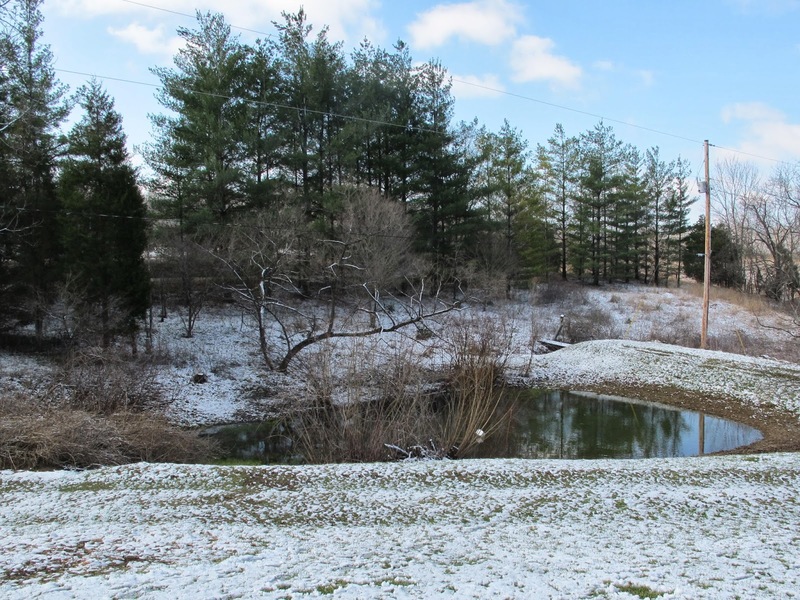 Yesterday’s storm gave us another inch of snow, but it was only a rain event at her school about one hundred miles south of here, so I’m arguing that my promise has not been broken. At Blue Jay Barrens we have had 22 snow storms this season and a total of 44 inches of snowfall. In addition we have had three more storms that brought a total of 0.8 inches of ice. This most recent storm began as rain and ended as heavy, wet snow driven by a powerful wind out of the north-west. 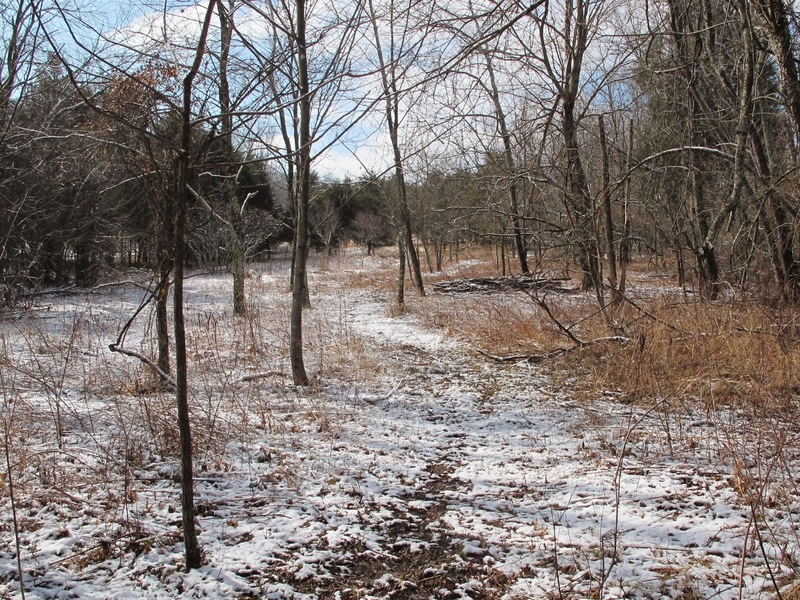 The snow was melting rather quickly, but the temperature suddenly dropped and the wet snow froze into a hard crust. 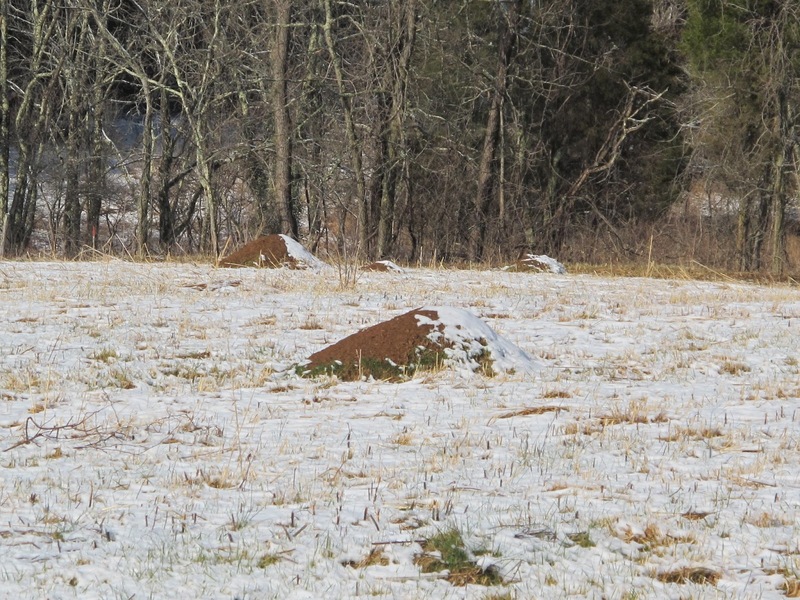 The north side of the ant hills developed a nice cap of snow. The south side was sheltered from the cold wind and retained much of its heat. The snow never got a foothold there. 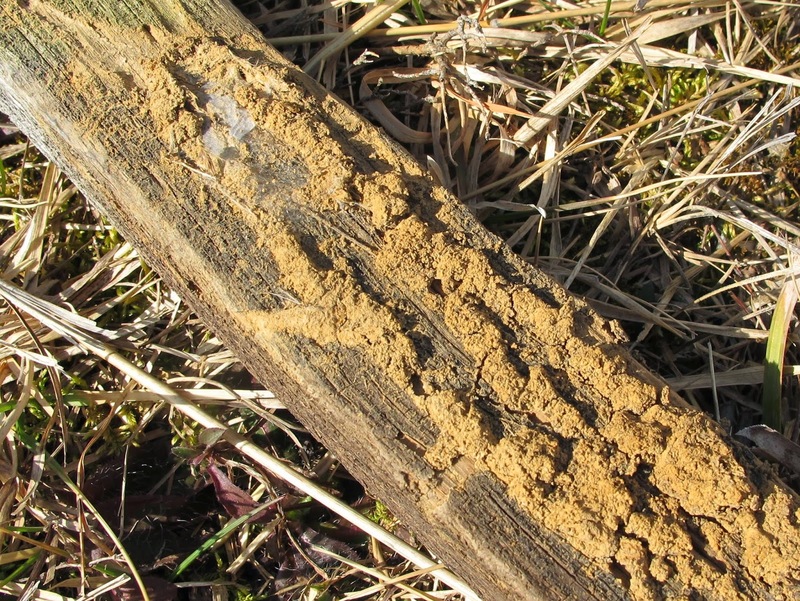 By mid afternoon the temperature was in the fifties, the snow was gone and the ants were out working on their mounds. 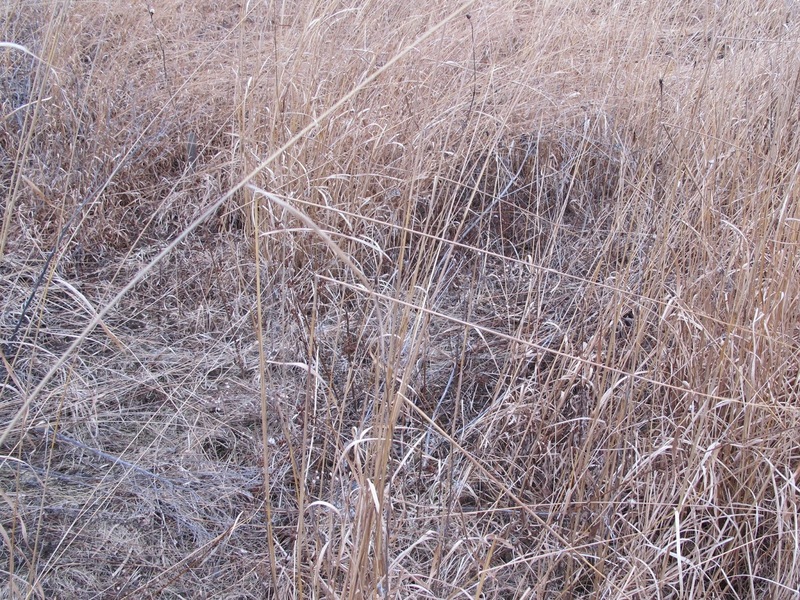 The Indian Grass has taken a lot abuse this winter, but it has managed to remain upright. 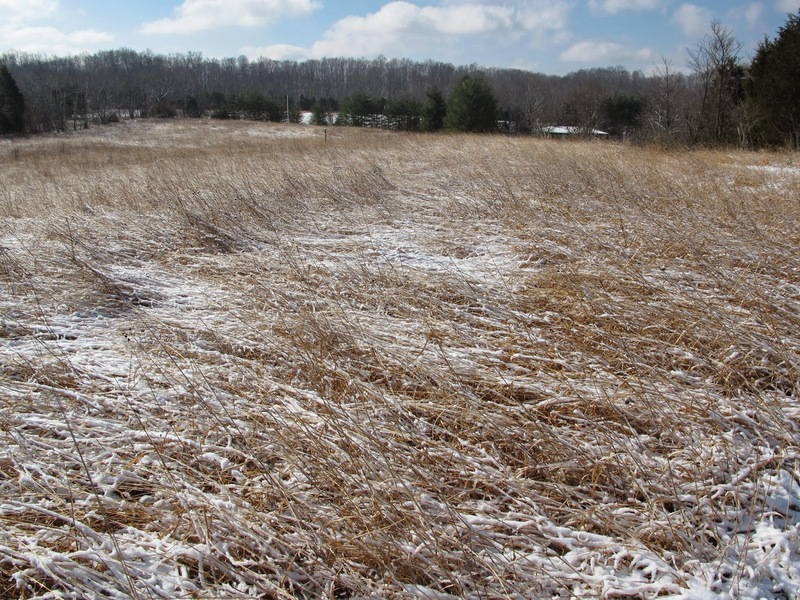 Dozens of sparrows have spent the past few months roosting and foraging in the tall grass stalks. Some patches of grass were pushed almost to the horizontal. By the end of the day they had rebounded considerably. 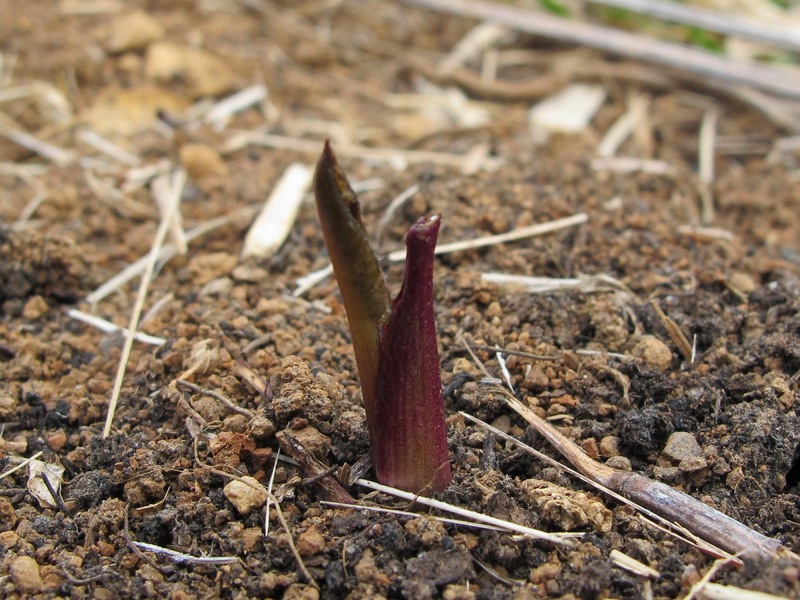 I’ve noticed that wet stalks have the ability to bend without breaking and tend to regain their shape as they dry. The top of the hill is always a pretty sight when covered with snow. 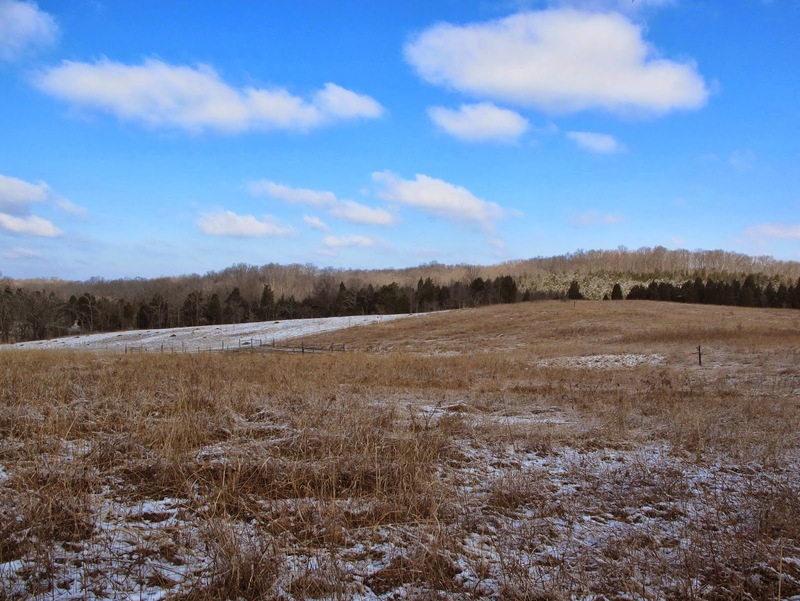 Many of the late spring blooming prairie plants are already beginning their growth and they won’t be put off by a little late winter snow. 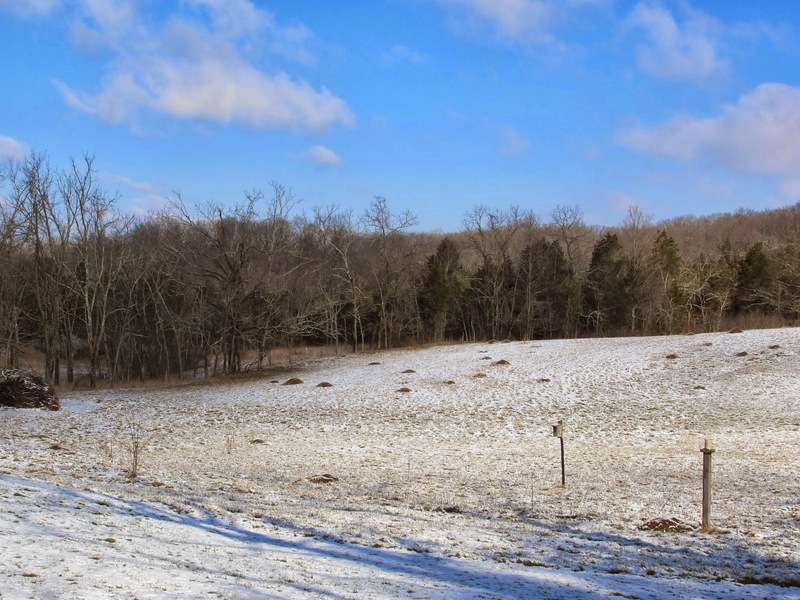 Snow cover makes it easier to see the open fields on a distant hilltop. Those fields are used for hay production and are already showing a lot of green. 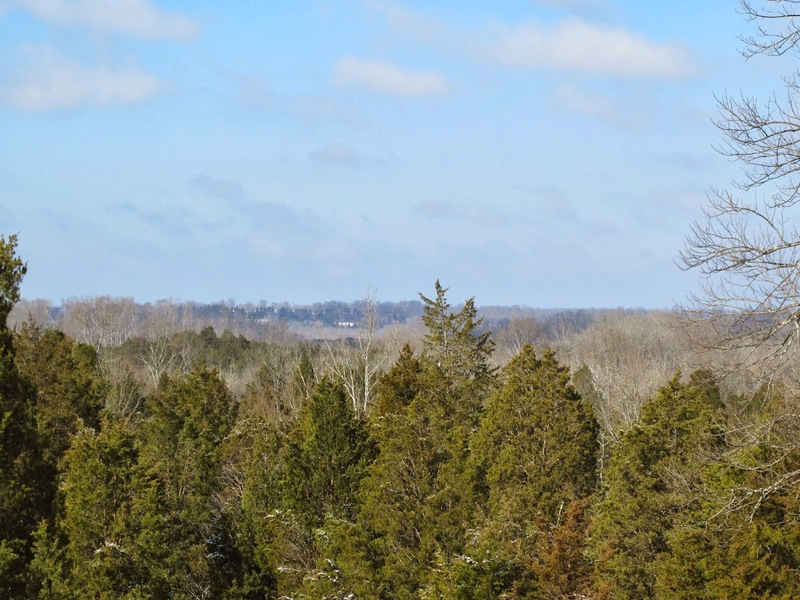 Once the trees put on their leaves, the distant view will be lost. 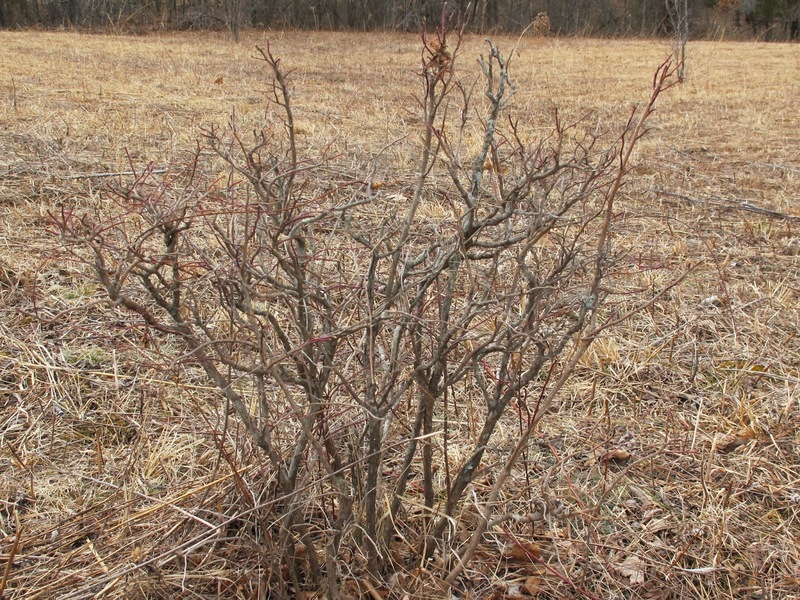 This former site of a Multiflora Rose infestation is looking clear and free of roses. I’m thinking about removing a couple of these trees to allow a little more sunlight into the field. It’s easy to tell the direction from which the storm winds were blowing. 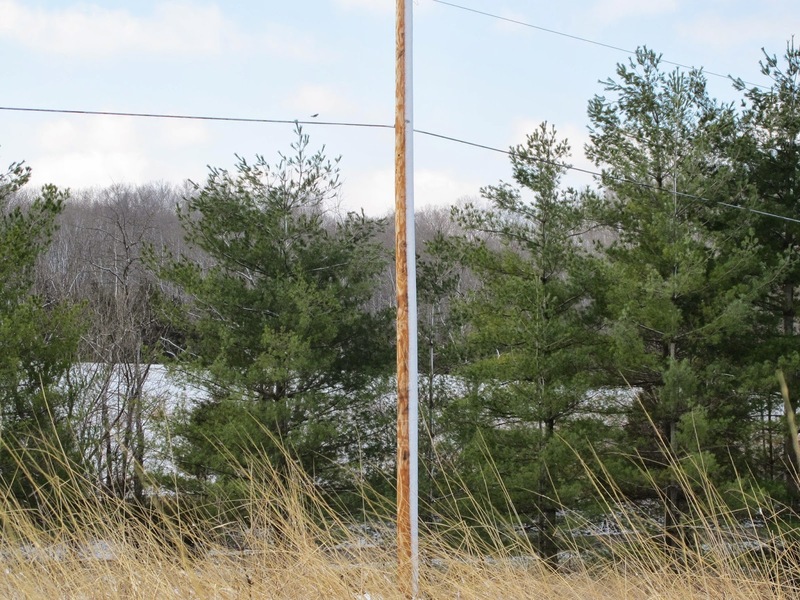 The snow was half an inch thick on the north-west side of the utility pole. I love taking photos from this position because everything in the picture is a part of Blue Jay Barrens. No matter how much things change on neighboring properties, this view should remain relatively constant. 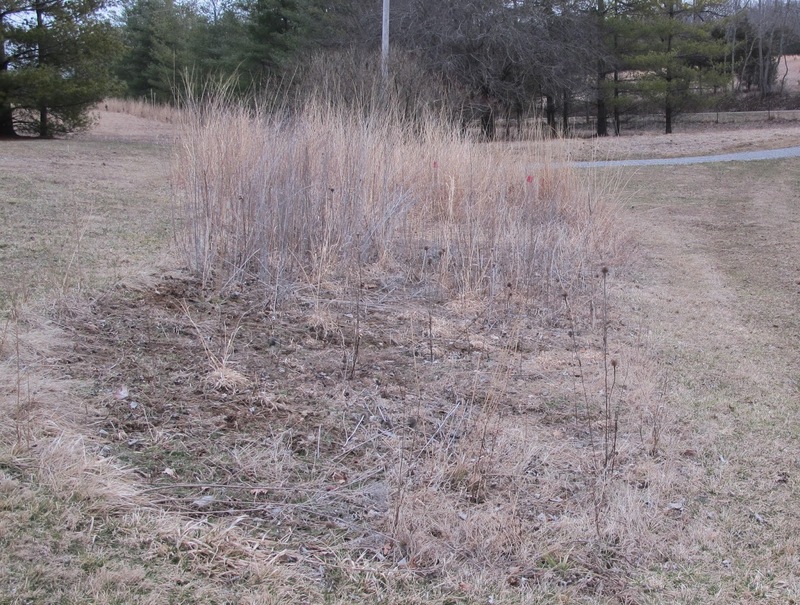 The dead growth in the Prairie Garden is removed each spring. I used to do an occasional spring burn, but abandoned that management technique because of the potential threat to the overwintering pupae of the state endangered Unexpected Tiger Moth, Cycnia inopinatus. 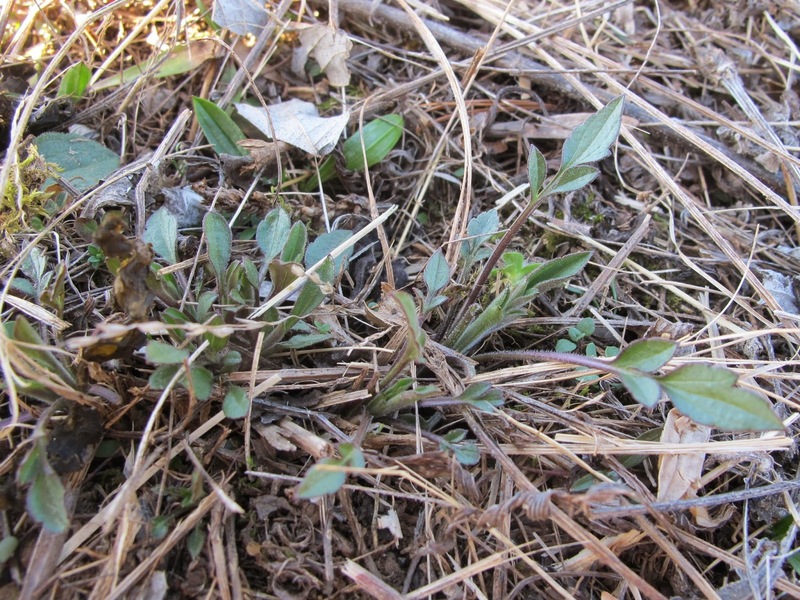 Now I mow and lightly rake, which greatly reduces the threat to the pupae tucked away in the leaf litter at the base of their larval food plant, Butterflyweed. 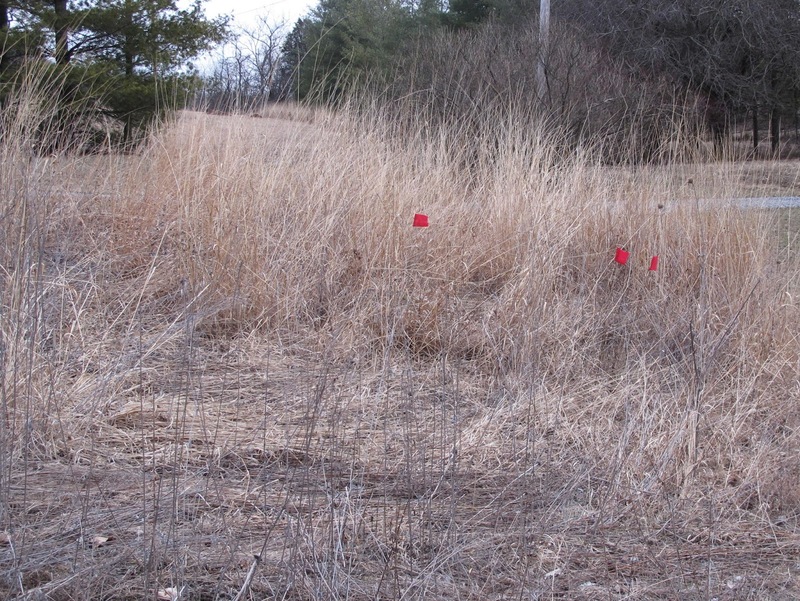 Red flags act as warnings to use caution with the mower in certain areas. I’ve learned not to trust myself to remember every little obstacle hidden in the tall grass. The plants would grow even if I allowed this dead material to remain. The reason for removing the top growth is to facilitate observation of the various growth stages of each species. Getting to know the plants at different times of the year was my primary motivation for creating this garden. Even though the grass looks impenetrable when viewed from a distance, it actually has many openings that allow sunlight down to low growing plants. It only takes a few passes with the brush mower to get things cut down. What’s left looks pretty brown. A closer look reveals a lot of color being displayed by early season growth. Western Sunflower, Helianthus occidentalis, begins growth early in the season. Even though Western Sunflower will grow to a height of six feet or more, most of the leaves remain at ground level, so the plant must make full use of early season sunlight before it becomes shaded by neighboring plants. This is Hairy Bittercress, a weedy non-native that I first found here about 20 years ago. It is now everywhere around the yard. 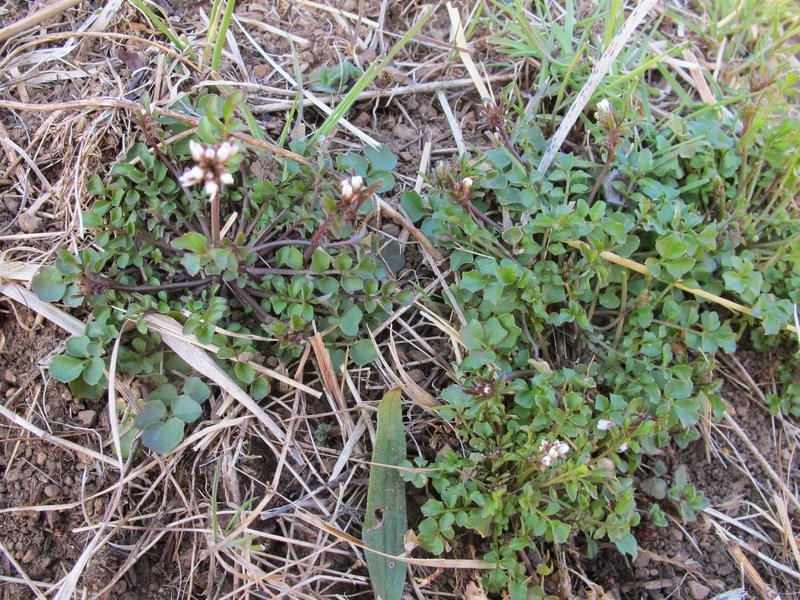 Hairy Bittercress thrives in bare, disturbed earth. 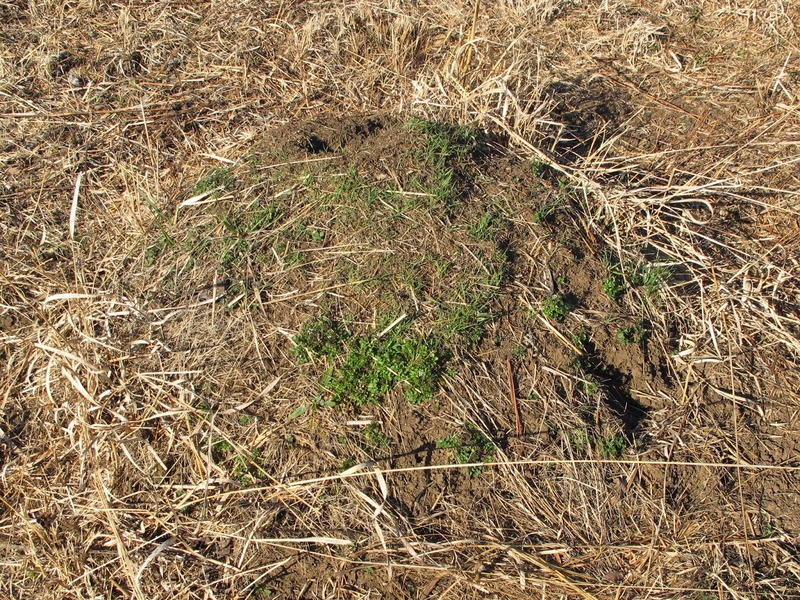 Large ant mounds provide an ideal growing environment. All of my yard mounds harbor this weed and the plant is beginning to show up on ant mounds in the fields. 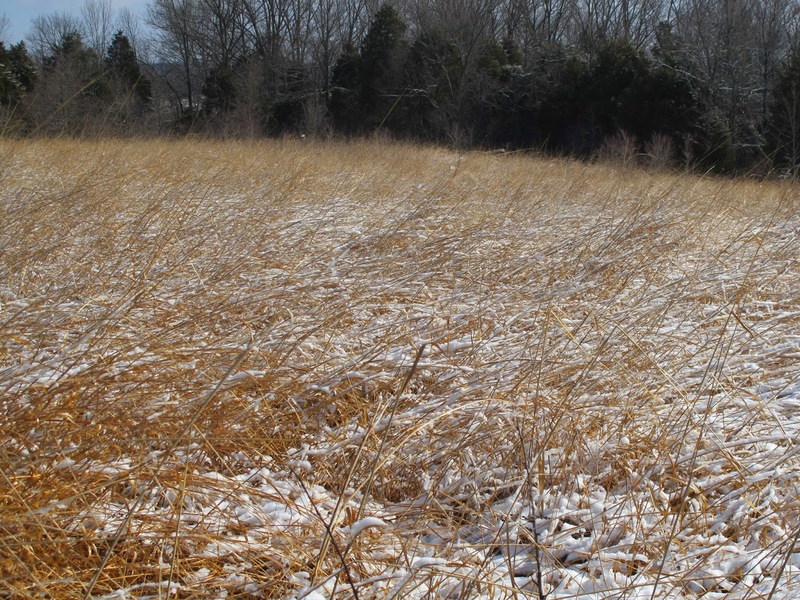 Fortunately, most of the greenery in the prairie garden is due to growth of native species. These are the basal leaves of Gray-headed Coneflower, Ratibida pinnata. 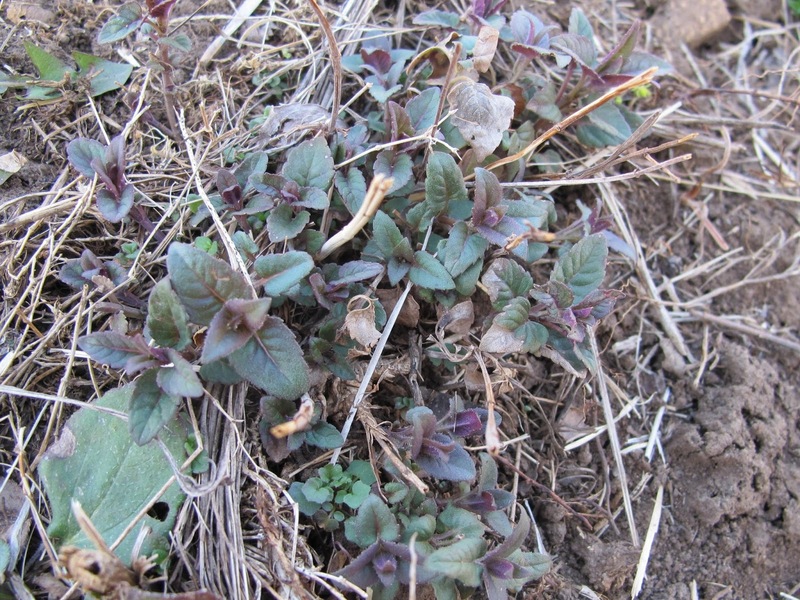 Wild Bergamot, Monarda fistulosa, is coming along nicely. A morning low of 11 degrees doesn’t seem to have done any damage to the leaves. The population of Round-podded St. Johnswort, Hypericum sphaerocarpum, keeps shifting its position around the garden. 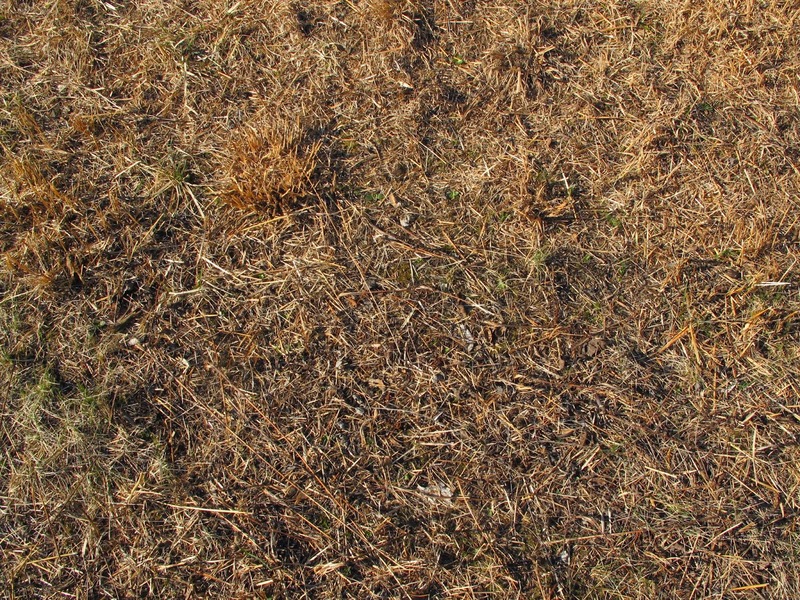 Clumps of plants live for two or three years and then die. There are always new plants coming up somewhere else to take their place. 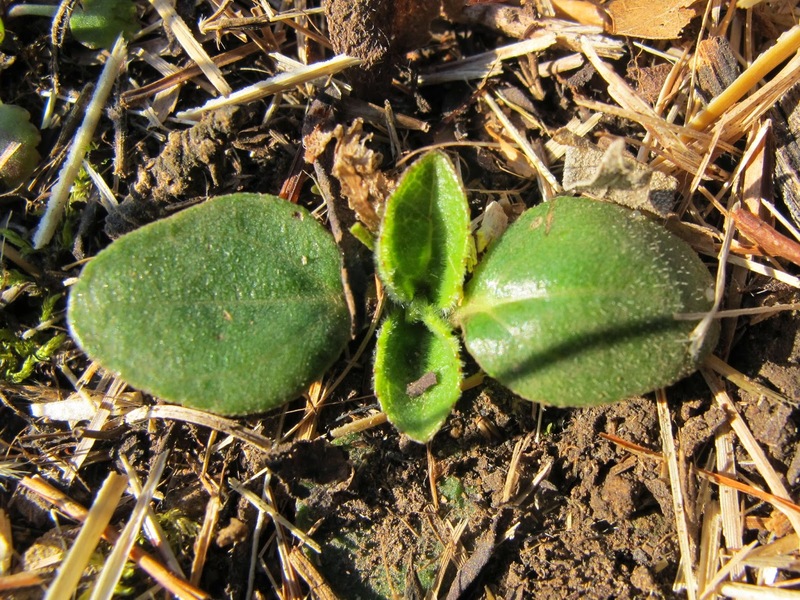 Prairie Dock has hardly made it out of the ground, but something has already nipped off the first leaf. 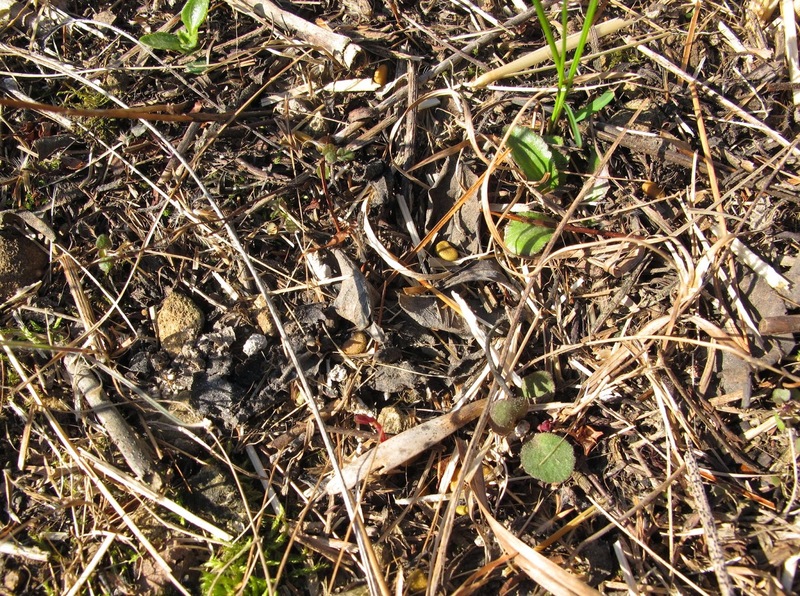 Deer browse heavily on this plant in the early spring, but ignore it later on. I imagine that more suitable forage becomes available as the season progresses. I suspect this to be the work of an Eastern Cottontail. There seems to be a rabbit’s nest in the garden every year. Usually she digs up some plant that I’m particularly sorry to lose. I went out yesterday to clean out the bird boxes and see what they needed in the way of repairs. Most boxes were in good shape and needed little more than a sweeping out to get them ready for this year. This box was the exception. Its need for repairs was obvious. 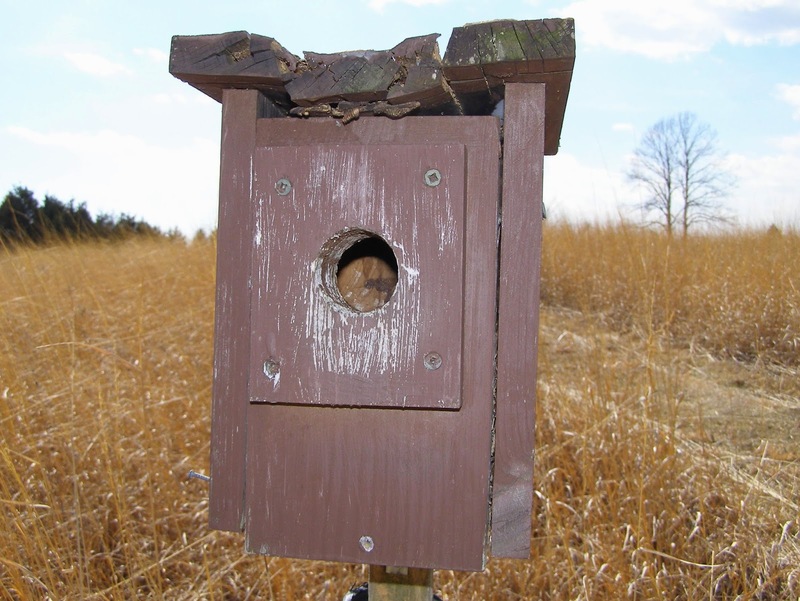 Fourteen young birds fledged from here last year; two broods of Bluebirds and one of Tree Swallows. 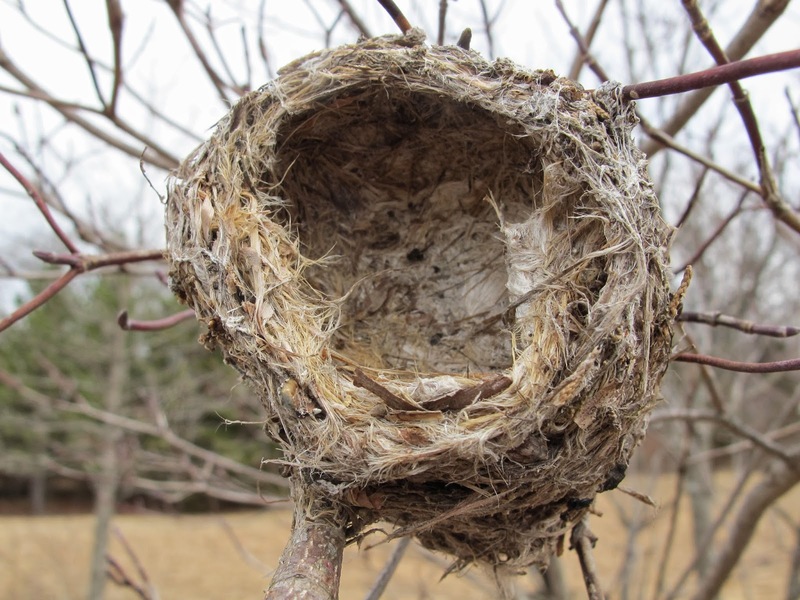 The final nest of the 2013 season was that of a Bluebird. What I saw in the corner of the floor didn’t look promising for the survival of this box. 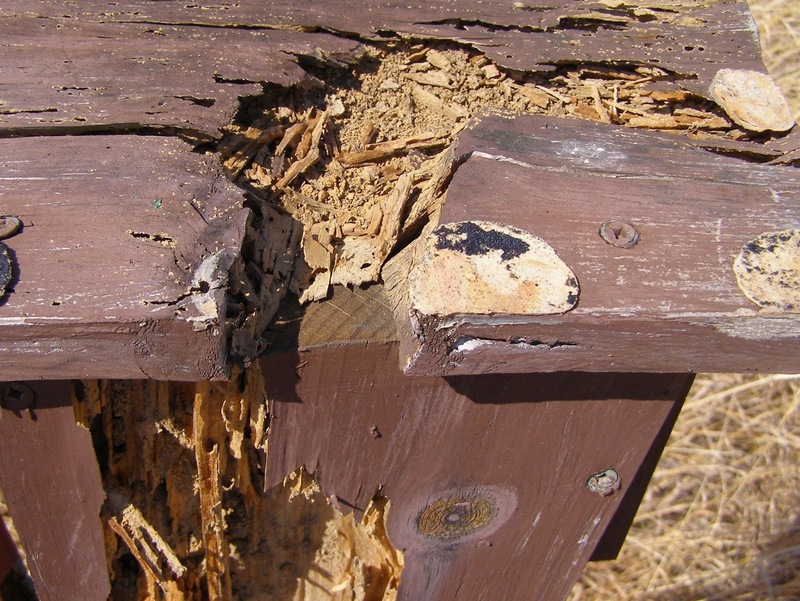 Termites have been at work here. The coat of paint was about all that was holding the side of the box in place. A little pull and that layer came away to reveal the remnants of a termite feast. The top of the box wasn’t in any better shape. The other side, back and front of the box were still sound, so the box is only half bad. 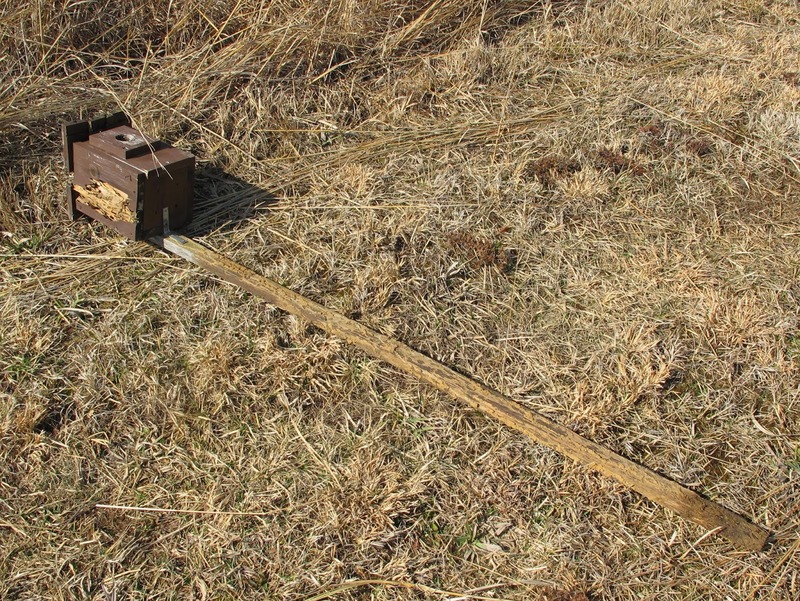 The box had been originally mounted to a wooden board that was then affixed to a steel fence post. 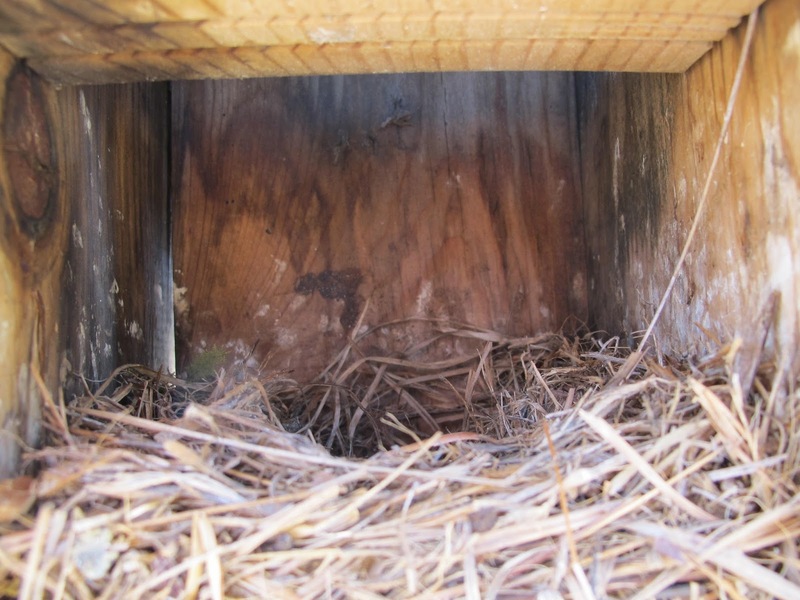 Both were enclosed inside a four inch diameter corrugated plastic pipe to discourage climbing predators from reaching the nest box. 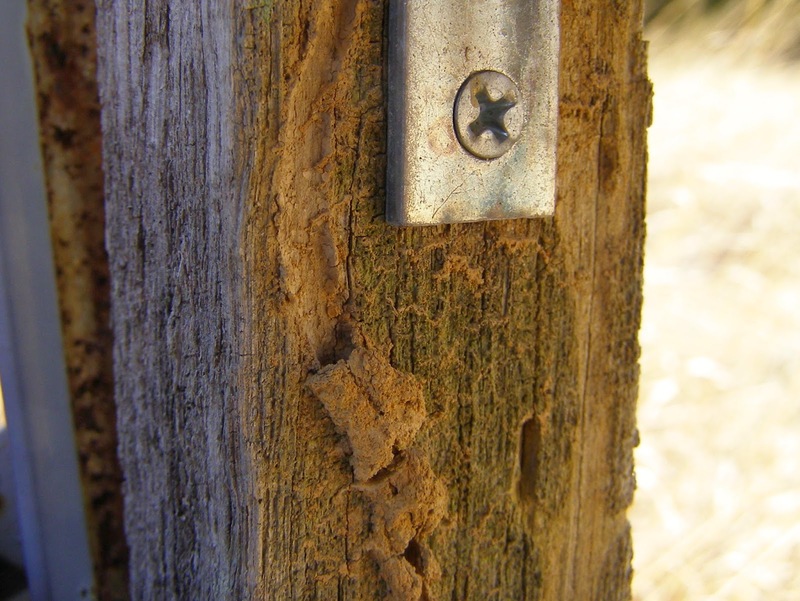 Termites accessed the birdhouse by way of the board. They avoid exposure and hide their travel route beneath an arched tunnel composed of mud and masticated wood fiber. Part of the protective cover has fallen away to expose their travel route partially carved into the wood. Being inside the plastic pipe protected many of the mud tunnels. These would normally not survive the winter weather. 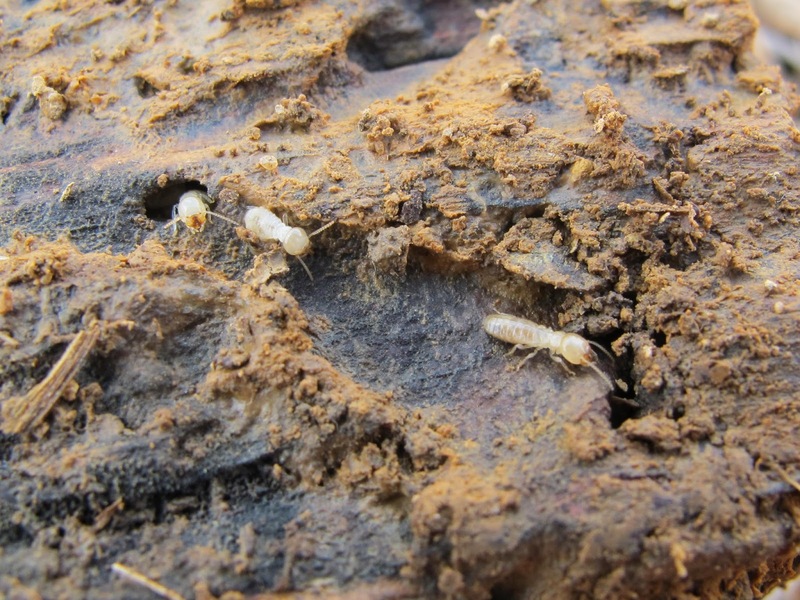 The termite colony is located in the soil where moisture and temperature are more stable. 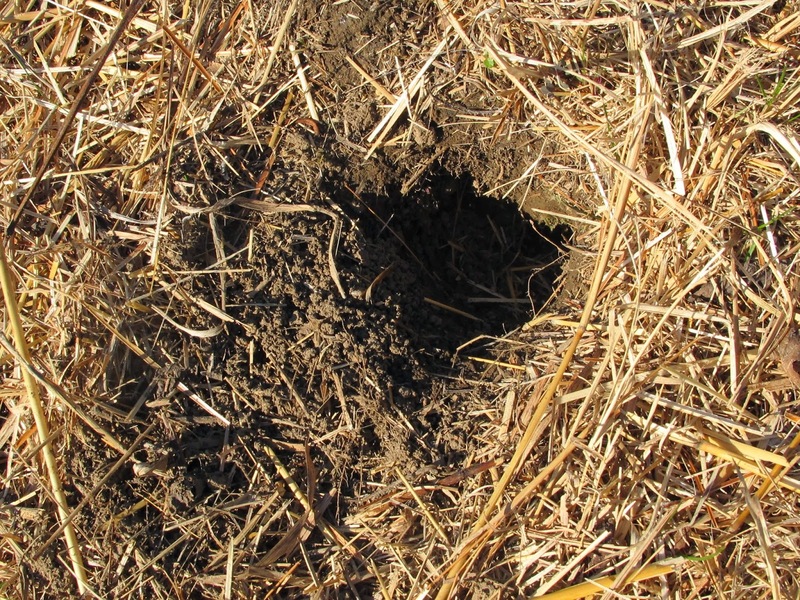 They utilize the mud tunnels to access wood, their food source, not in direct contact with the soil. 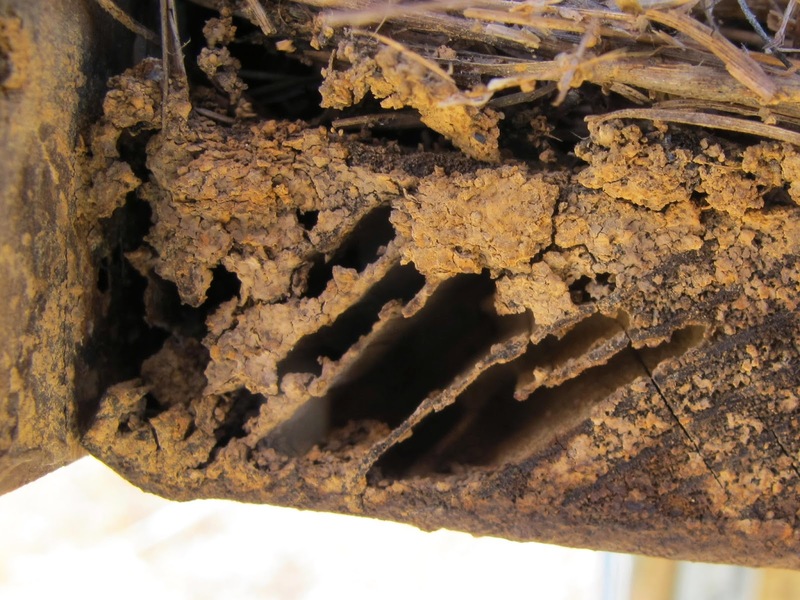 Termites are in danger of desiccation if exposed to heat or dry air and are a prime prey item for a long list of insect eating predators. They survive by remaining hidden. 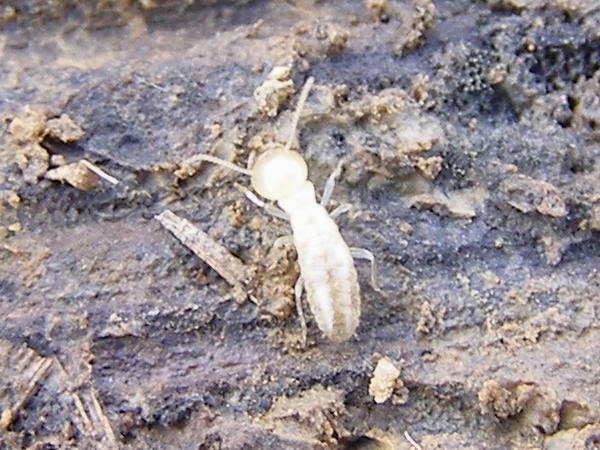 The small, soft bodied termite doesn’t look threatening, but the combination of mandibles capable of chomping into wood and intestinal microorganisms that aid in wood digestion make these insects champions at producing compost from large chunks of wood. 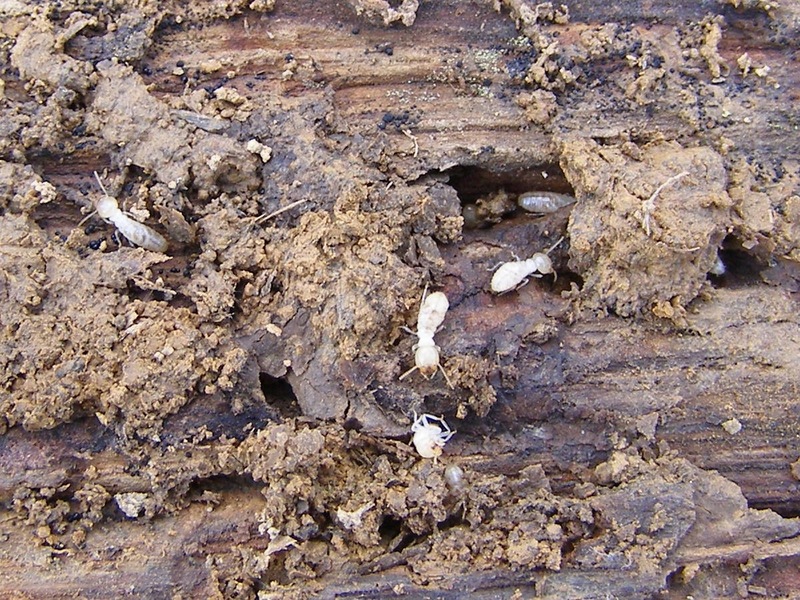 Termites are social insects that can develop large colonies centered around an egg producing queen. When I was younger, I went through an ant farm period where I maintained several ant colonies living between sheets of closely mounted clear plastic. After finding a piece of firewood full of termites, I filled an empty ant farm with some soil and wood chunks and loaded in as many termites as I could get from that firewood. There was no queen, but the hundreds of workers managed to go about their business as usual. 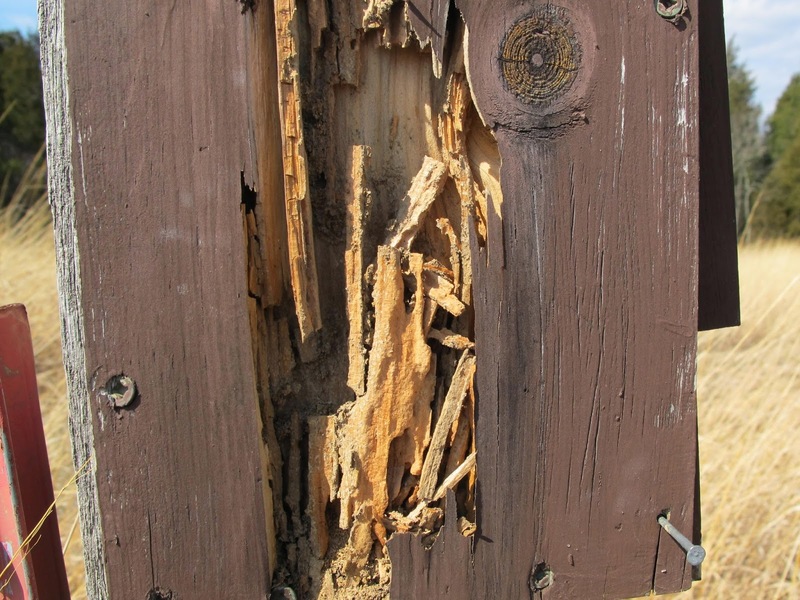 The termites were fascinating to watch and flourished for several months until my father noticed them. I tried to explain that they were no threat to the house, but they were evicted along with several other creatures that he felt should not be living in a young boy’s bedroom. 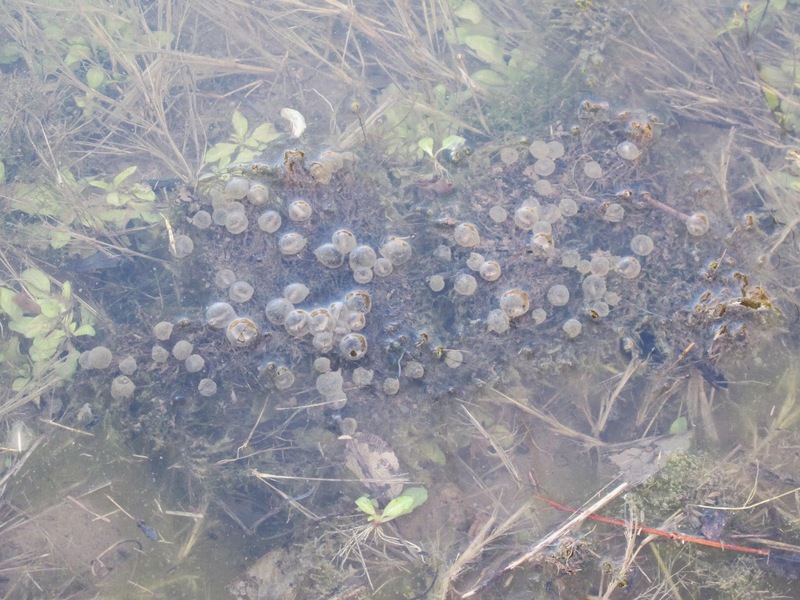 Wood Frogs had a brief breeding frenzy just a few days following the salamanders. In some years the Wood Frogs spend as much as two weeks in the pond. This year they’ve been active for a night or two and then absent for a couple of nights before returning. I try to keep twigs and branches away from the shoreline so the frogs and salamanders are forced to deposit their eggs in deeper water, but winter ice storms broke some branches from the shore hugging dogwoods and these ended up getting covered with eggs. 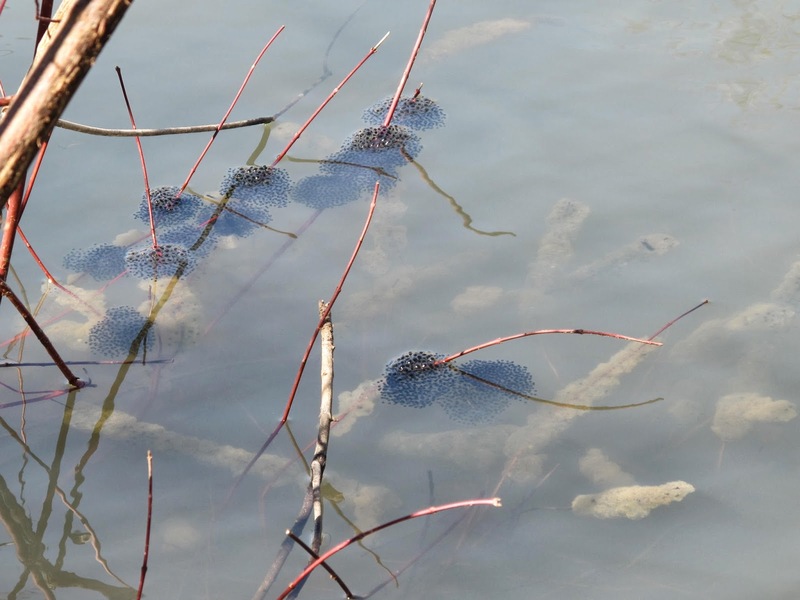 Fluctuating water level can easily leave these eggs hanging in the air. Part of my daily routine is to check the eggs to see if a rescue operation is in order. 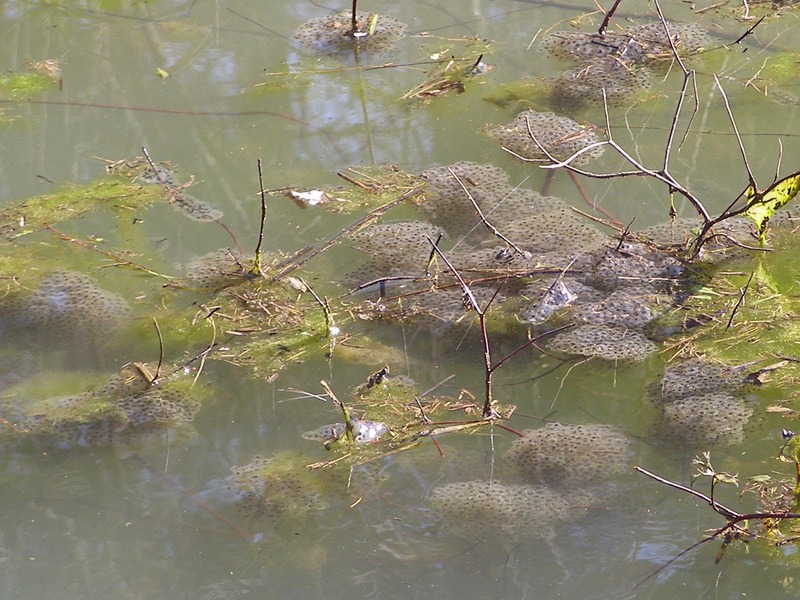 My floating branch, staked out in the deepest part of the pond, successfully attracted the majority of breeding frogs. 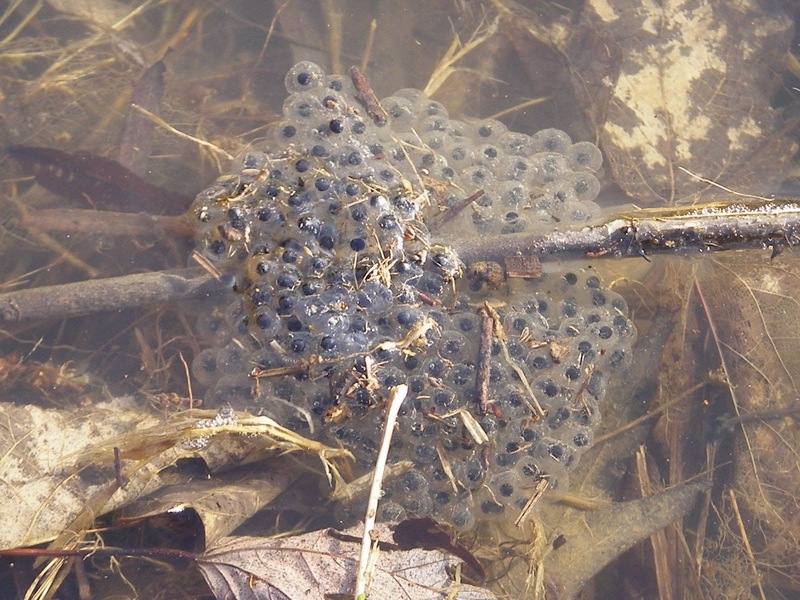 The Wood Frog egg masses have effectively camouflaged those of the salamanders. This branch rises and falls with the water level, so the eggs are safe from desiccation. 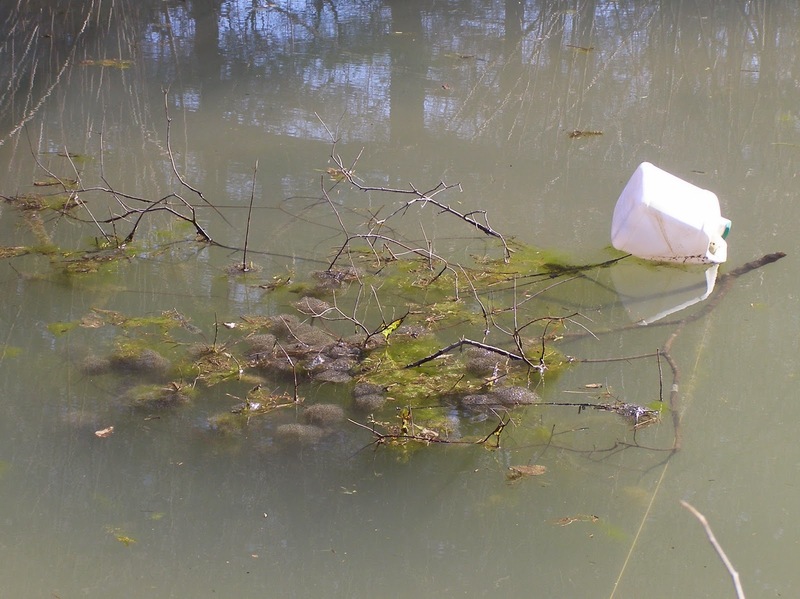 A few egg clusters were attached to dead twigs floating in the water. Those that I’ve found at the edge of the pond have been relocated to the toad pool. 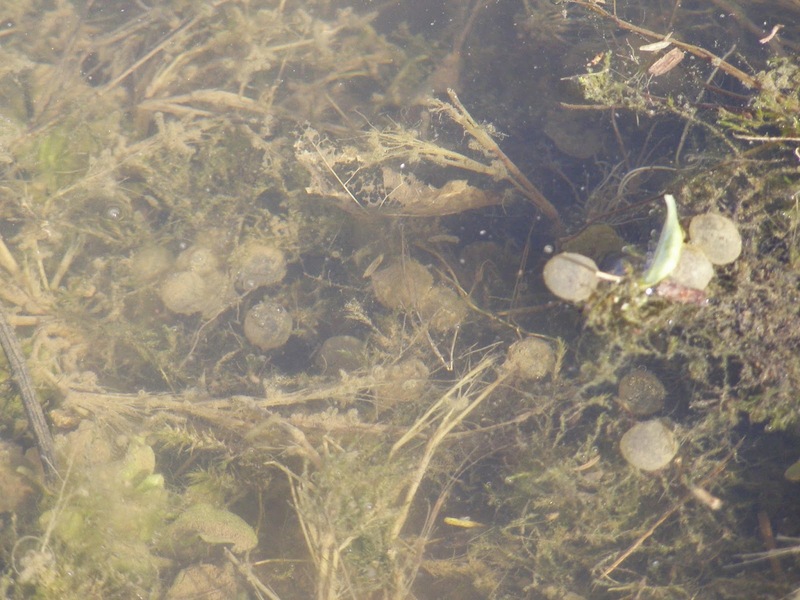 While gathering up some Wood Frog eggs, I noticed this patch of moss that had come loose from the pond bottom. 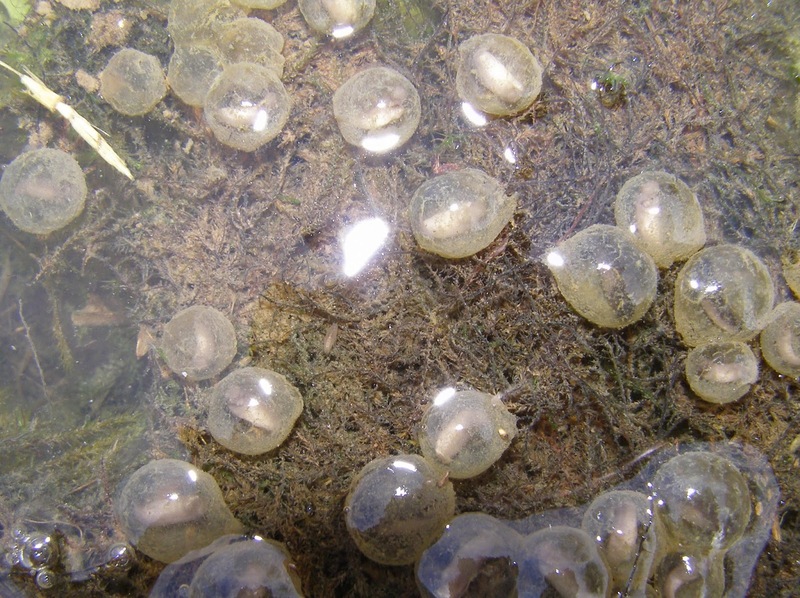 On the underside of the moss was a collection of eggs that had to have come from a Streamside Salamander. I want to make it clear that the moss I am referring to is the terrestrial type that established itself in the pond bottom during the dry season. This is not algae, which many people refer to as pond moss. Streamside Salamanders, which normally lay their eggs beneath flat creek rocks, have utilized the moss mats as an alternate substrate. 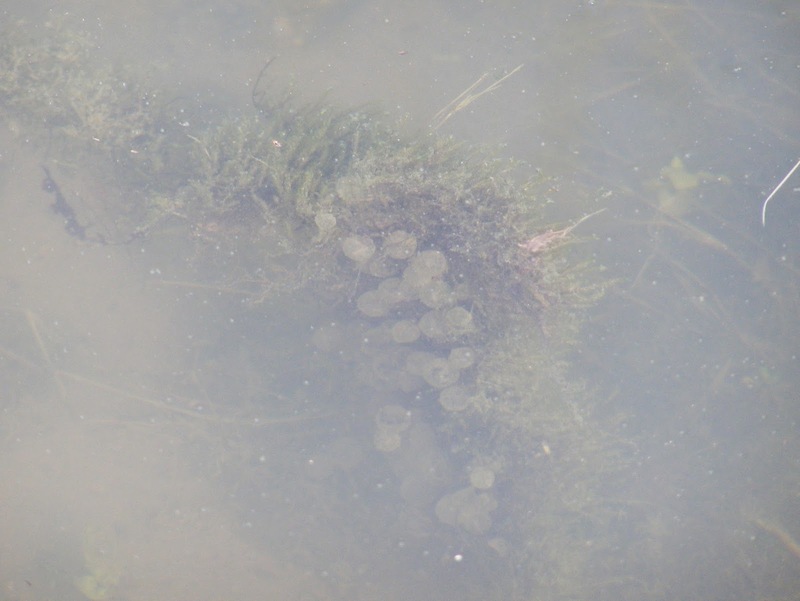 I imagine that the activity of the breeding salamanders detached a large area of the moss mat from the pond bottom and that is the reason so many patches of egg bearing moss are now floating free in the pond. Embryo development is well underway. The pond water temperature fluctuates and tends to stay warmer than that in the stream. I suspect that this accelerates development of the pond reared Streamside Salamanders over that of their creek bound relatives. There are dozens of moss chunks floating about the pond. Oxygen produced by the moss causes the mats to float green side up. Most of those I checked carried a load of eggs beneath. 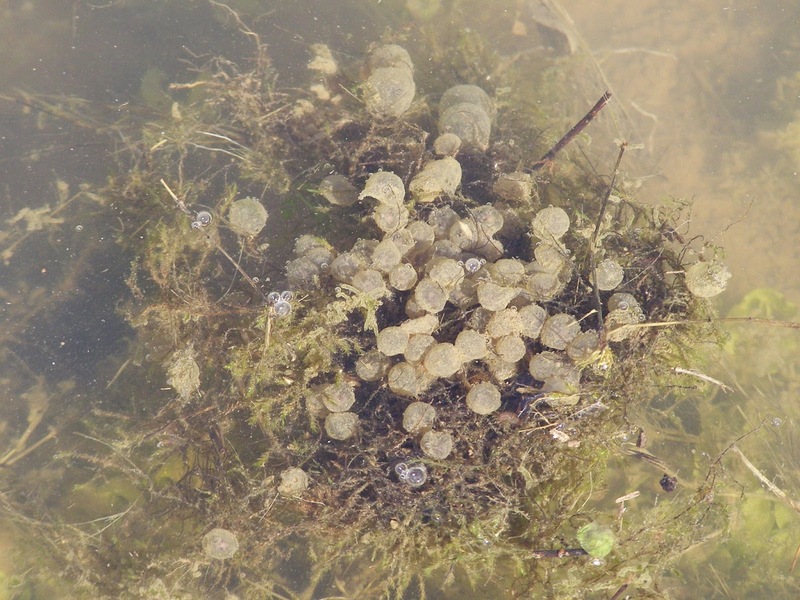 Eggs could also be seen around the edges of moss mats still maintaining contact with the pond bottom. I imagine that the bottoms of these mats are also egg laden. Now I know that the Streamside Salamanders are definitely breeding in the pond. I’m happy to have this confirmation, but presence of the Streamsides in the pond also makes it less likely that I actually have the look-alike Smallmouth Salamander living at Blue Jay Barrens. 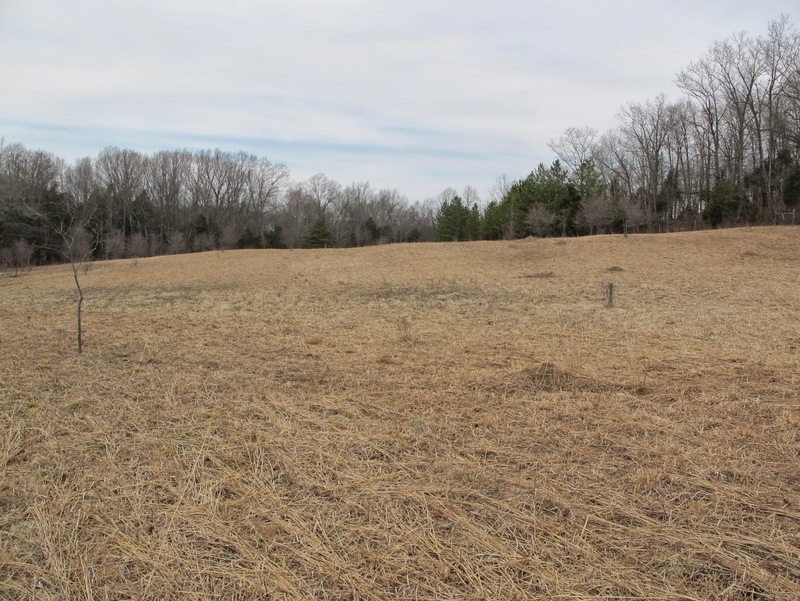 Fields at Blue Jay Barrens are mowed to achieve certain management objectives. 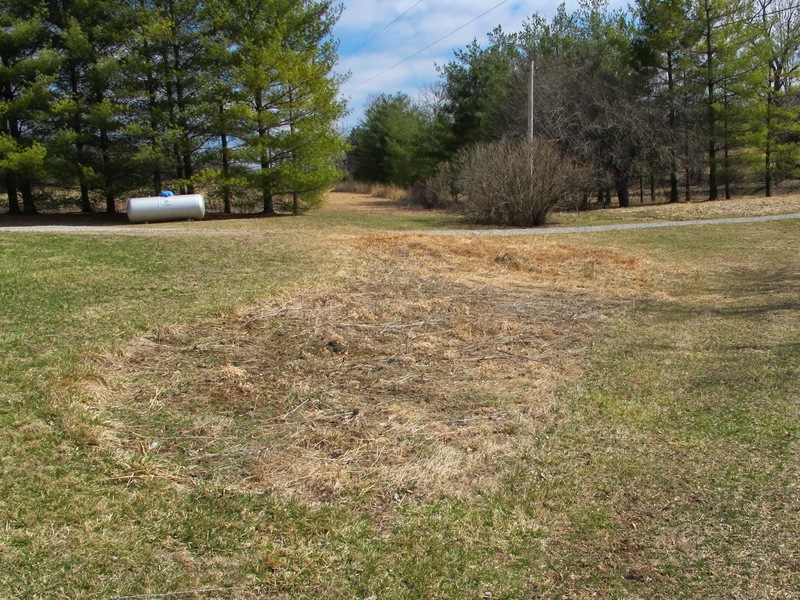 The mowing last fall was the second in a series of activities intended to clear the field of unwanted trees and shrubs. I am currently evaluating the effectiveness of the first two steps and estimating the time required to complete the next step. 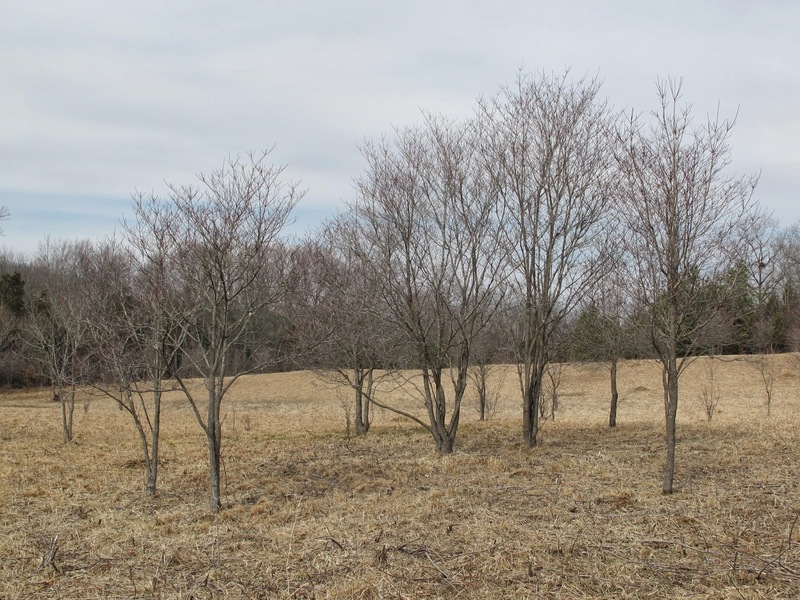 Sometime later in the spring I’ll be cutting and stump treating young Red Maple and Ash that are rapidly infiltrating some of the wetter areas of the field. 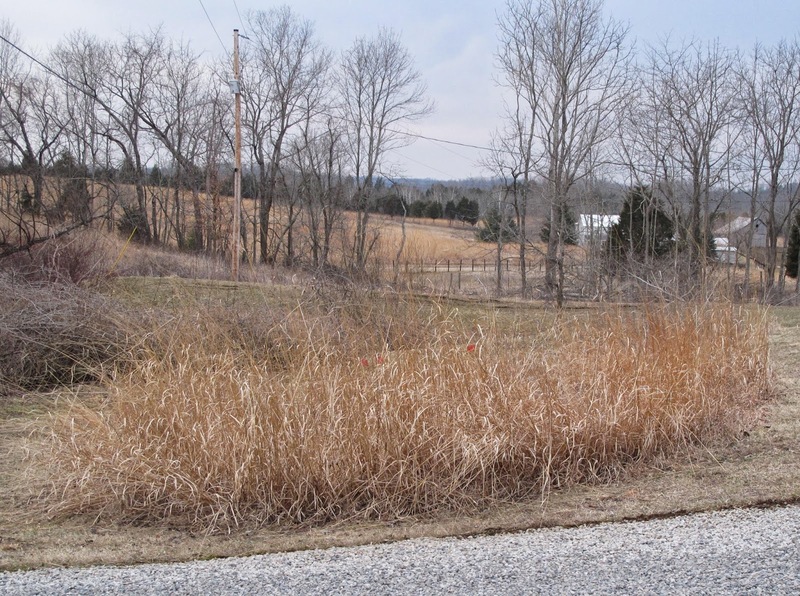 The prairie grasses grew very well last year and left considerable dead material on the ground after the mower passed. 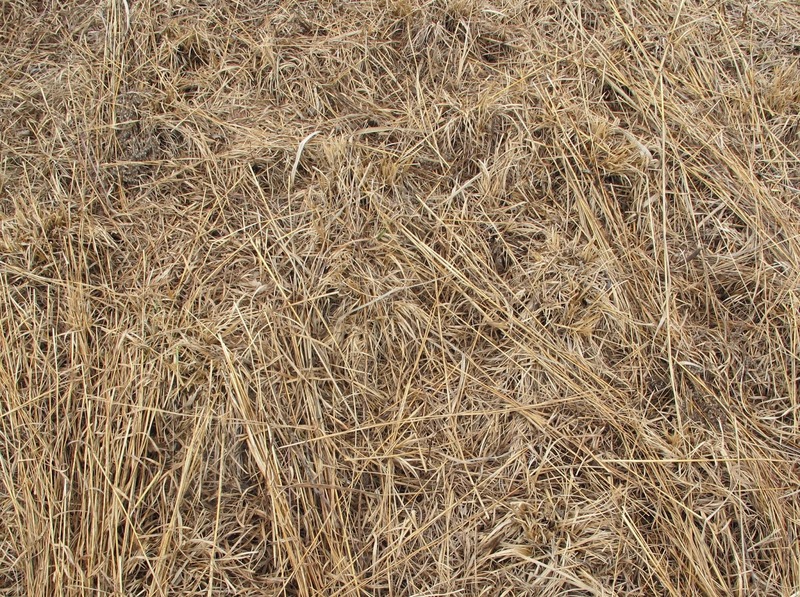 By next fall, all of this dead material will have decomposed. The nutrients and organic matter will cycle back into the soil. 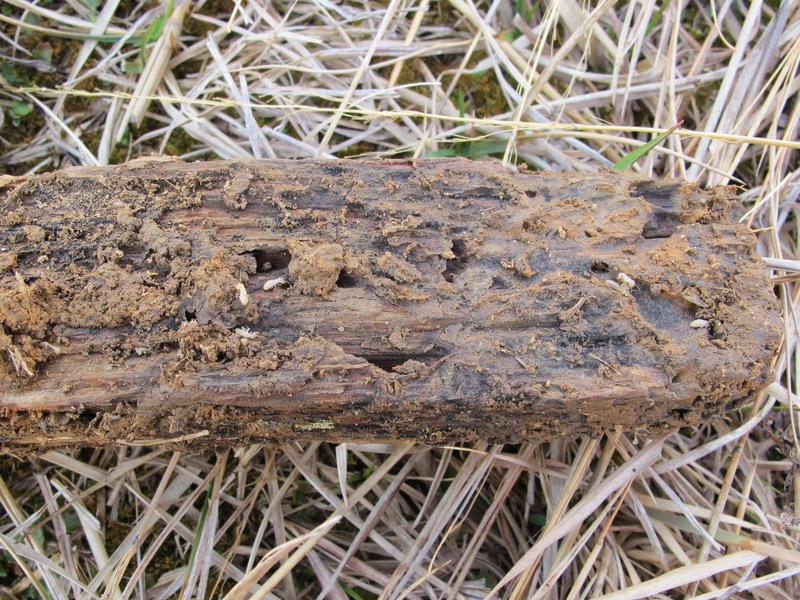 The disappearance of this material is an indicator that the soil ecosystem is healthy and functioning as it should. 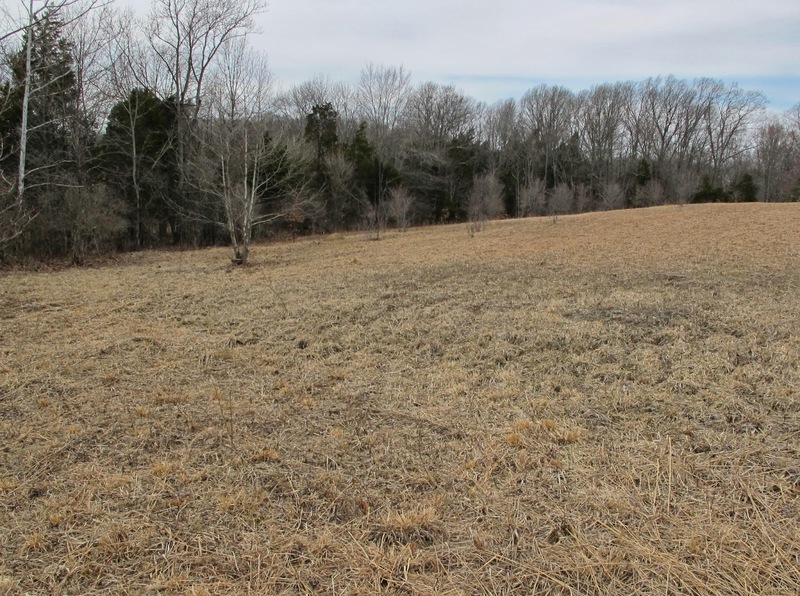 Small cedars were cut from this field prior to the fall mowing. Most of those cedars were in the one to two foot height range, but I cut every little cedar that I could find. While mowing, I discovered and cut more small cedars that had been missed earlier. 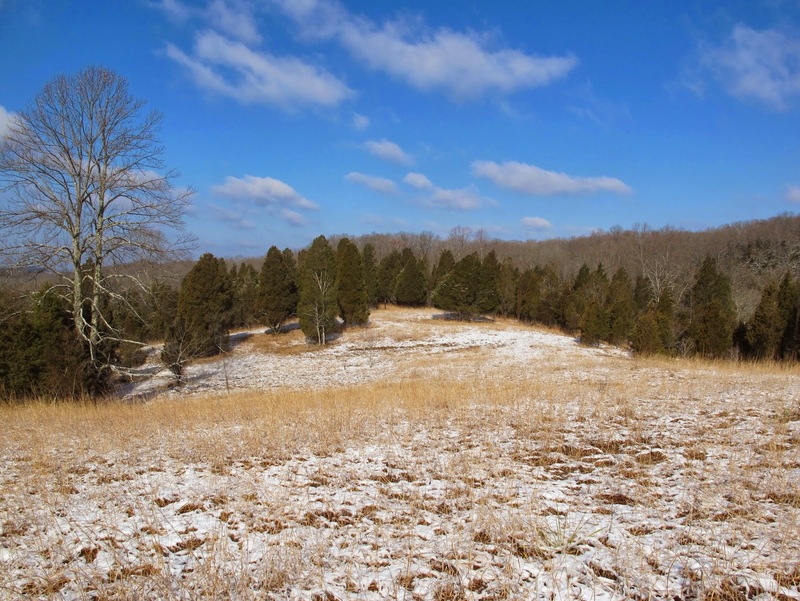 The heavy snows this winter managed to flatten the grass and allow more small cedars to become visible. Now I’m cutting very small cedars that I was unable to see earlier. This field will be as cedar free as I’m able to make it. 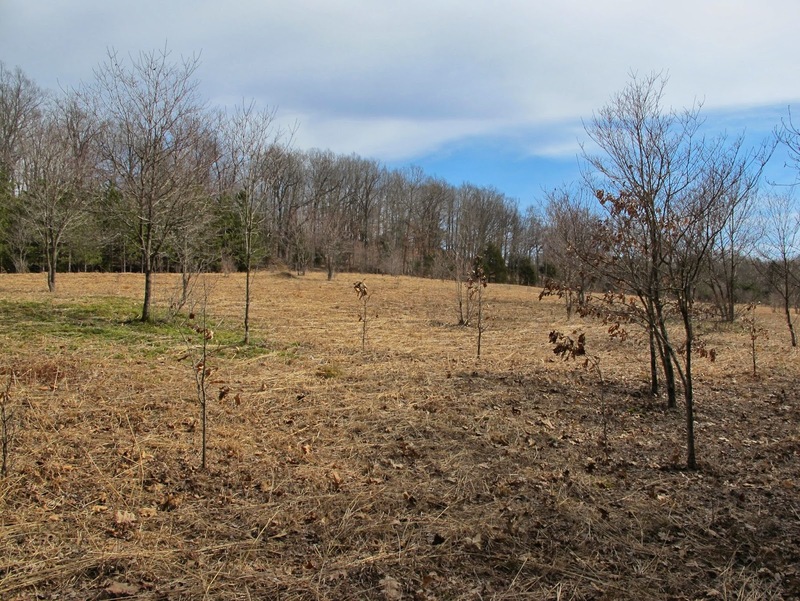 There are some trees and shrubs that are left undisturbed. 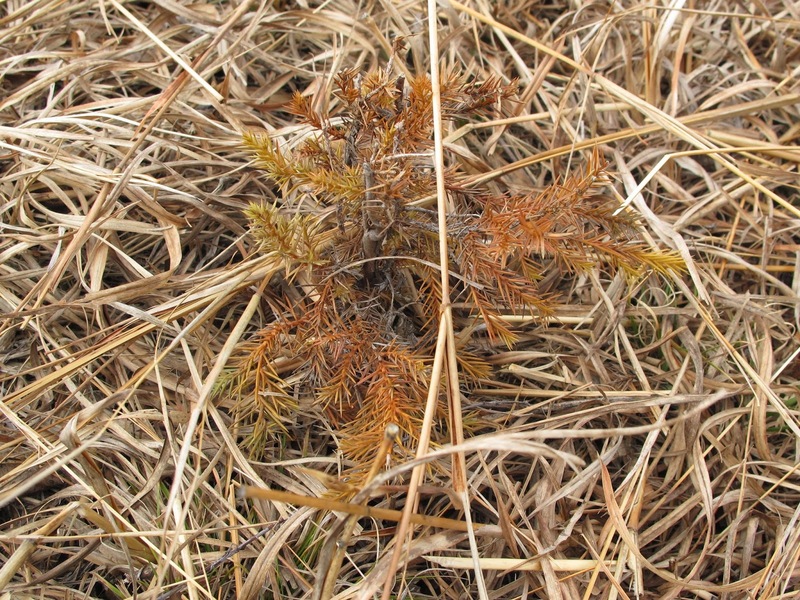 Prairie Rose, Rosa setigera, is untouched with the hope that it will produce a nice floral display next summer. I believe that I’ve finally reached the point where mature native roses outnumber the invasive non-native Multiflora Rose. 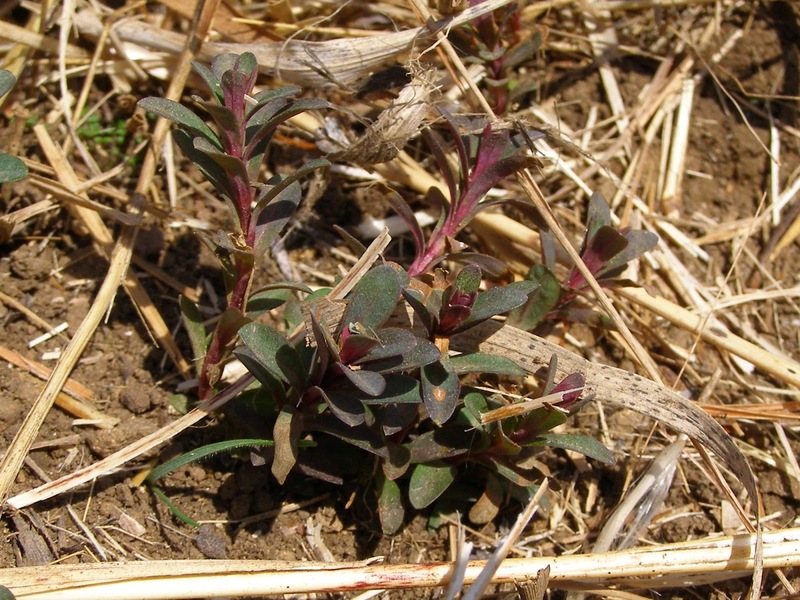 It’s plants like this Shrubby St. Johnswort, Hypericum prolificum, that make mowing difficult. A watchful eye is required to spot small plants hidden in the grass. If it weren’t for the dark colored seed capsules, I would not see this plant before the mower ran it over. I do manage to run over a few desirable woodies, so it’s fortunate that most woody plants will grow back if mowed off. It’s the sound the mower makes when cutting something more substantial than grass that alerts me to the fact that I’ve shortened something meant to be left tall. Deerberry, Vaccinium stamineum, is fairly easy to see. Besides watching in front of the mower, I also keep a watch to the side that has yet to be cut. When I spot a plant that should be saved, I mark it with a blue flag that is easy to see the next time I pass that way. Larger trees and shrubs are found primarily around the outer margins of the field. 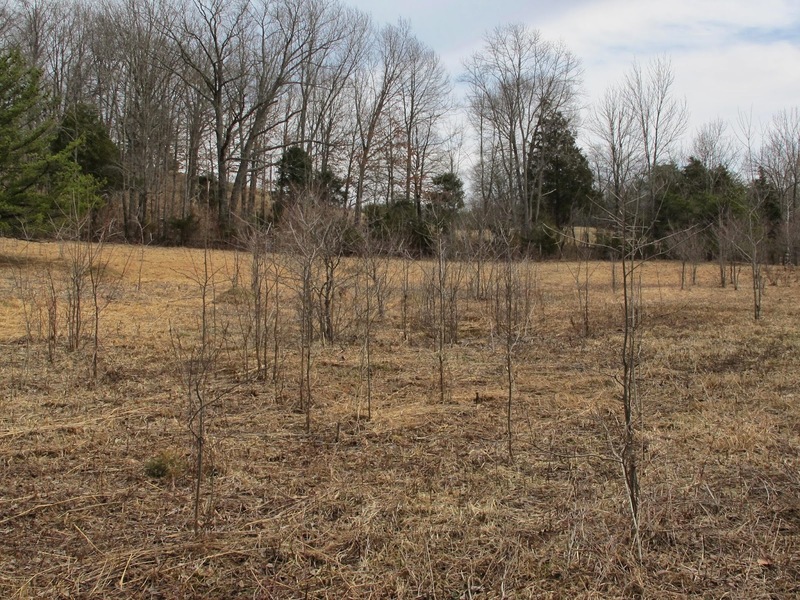 Flowering Dogwood, Cornus florida, which used to be a common woodland understory plant, lost their battle to disease and survived as only a few scattered individuals growing in the open field. My management in favor of this species has resulted in a healthy population of mature Dogwoods. Many have grown into small trees that produce a showy display and a hefty crop of berries. 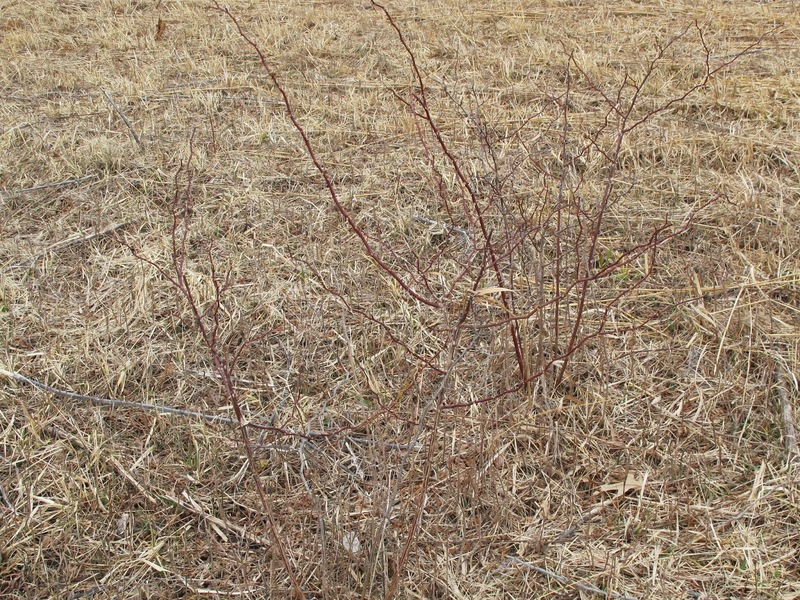 Many of the open field shrubs host bird nests. This nest is looking rather weathered, but I’m guessing from the thistle down that it housed a family of Goldfinches. 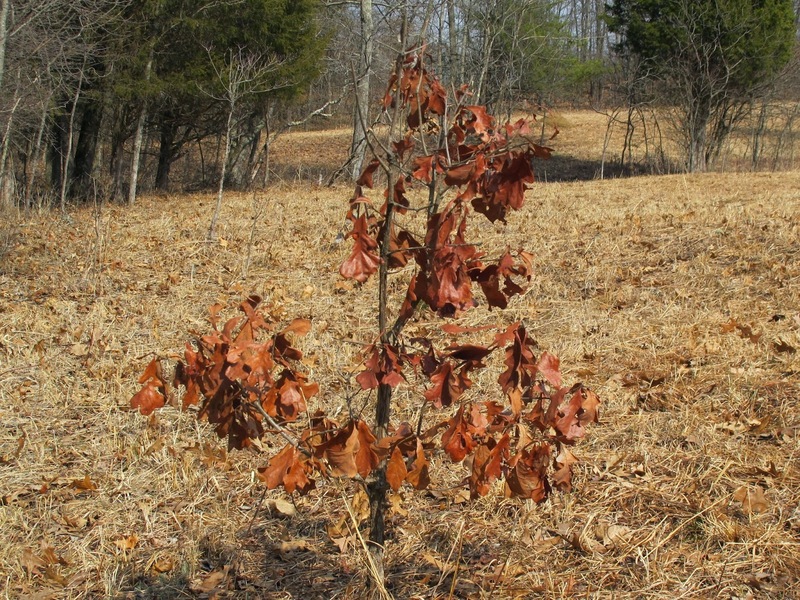 Oaks are the second most abundant type of woody plant left in the fields. 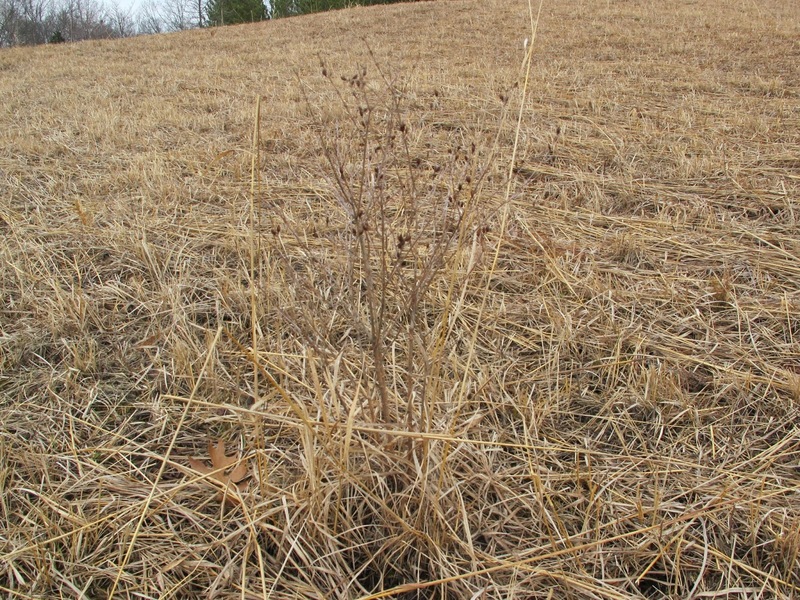 Many of the prairie species in the field have relationships with oaks. I thought it desirable to give some space to the oaks while I learned about these relationships. The oaks can always be cut out later if that turns out to be the best management option. One positive association of which I’m aware is that between the oaks, Allegheny Mound Ants and Edwards’ Hairstreak Butterflies. I’ve written before about this relationship. Searching the list of blog subjects in the right hand column will provide you with more details. 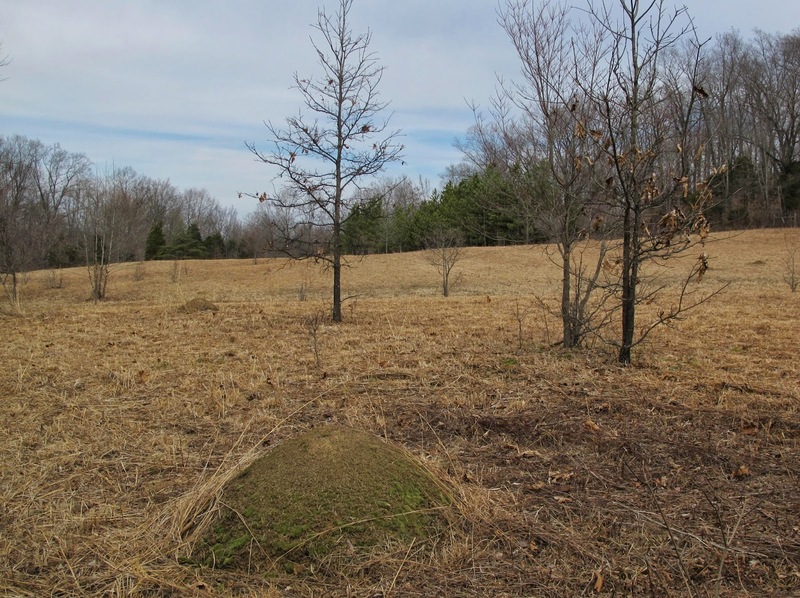 Without oaks and ant hills, you cannot have the butterflies. The butterflies were first seen in this field ten years ago and have been increasing in number. Apparently the decision to grow oaks has had some beneficial effects. In some places the tree canopy is blocking enough sunlight to change the composition of the ground cover. These changes are being monitored and a future decision may have to be made about the removal of some of the larger trees.